As a luxury custom home builder and modern architect, Phil Kean Design Group uses only the highest quality furnishings and materials within our client projects. With an attention to detail an indescribable ability to fashion a masterpiece from a tree trunk, Robin Wade’s extraordinary wood furniture exceeds our standards for excellence. His pieces have found their way into Phil Kean’s contemporary interior design projects over the years and are among our favorites as they instantly add an air of natural warmth to any space. Each Robin Wade original begins with an ethically sourced trunk. The locally harvested wood is then sliced into natural-edged slabs and left to dry for years before it is ready to be cured in a kiln. Only then can it be transformed into Wade’s legendary furniture pieces. This “Slow Studio process” ensures the end product is made right and made to last. Over the years, Wade has perfected this process and organic approach to furniture building to create truly innovative furniture items that combine nature’s appeal with modern elements and clean lines. Wade’s pieces transcend the world of furniture making and become pieces of art in their own right. Paired with our signature contemporary design style, Wade’s warm wood pieces add interest and character to any room. 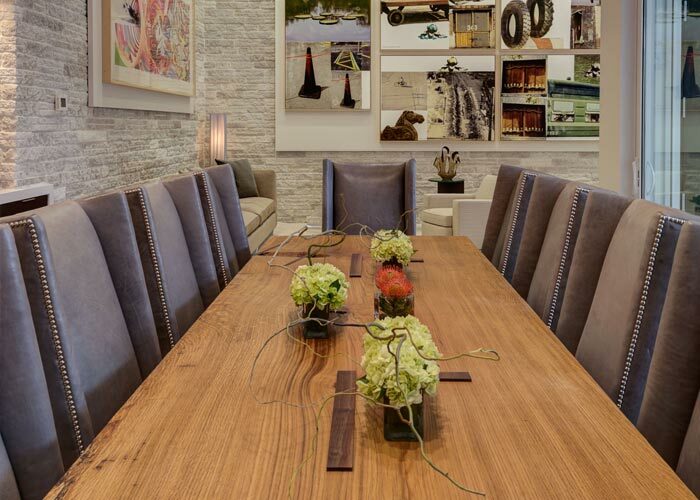 From live-edged dining tables surrounded by sleek-lined chairs to raw coffee tables paired with chic leather sofas, these pieces are bona fide conversation starters and have quickly become a favorite among our clients. Be sure to visit Robin Wade Furniture’s site to see more of this artist’s amazing work and take a look at our portfolio for a deeper peek inside our homebuilding projects and the use of Wade’s products in our modern interior design projects.